Recently the media has unveiled some unique details regarding the mysterious IMMO project. The rumors about IMMO have first appeared in April. Recently, several well-known cryptocurrency community experts, including Tim Draper, Lon Wong, Jimmy Song, Simon Cocking and others, have shared their comments about the IMMO. Vitalik Buterin did not stay aside. Since all developments were carried out in strict confidentiality, no confirmed information about IMMO was available. However, a document has come to light, unveiling some of the IMMO secrets. According to the document, IMMO aims to become a so-called reserve cryptocurrency. The fundamental values represented in an equivalent number of resources available to IMMO FOUNDATION are the core of the currency. It has been widely speculated in the media that the document is apparently being used for personal communications with private investors and funds. It is likely that the funds collected during the first private investment rounds will go towards the acquisition of resources that will essentially become a sort of “yardstick” of IMMO. However, no facts confirming the sale of IMMO tokens have yet been made public. According to the same document, such a cryptocurrency – real assets bundle has been made possible by development of a unique legal scheme, enabling the IMMO token to not only hold a value, but also the the right to control a token’s equivalent of resources. The relationships between token holders and the IMMO project, as it follows from the document, are regulated with strict accordance to the trust fiduciary relationship. Such a relationship enables the world’s richest people to acquire, keep and pass on their property. It is still unknown how this particular model of traditional economy will play out in the blockchain and cryptocurrency context. However the surrounding the project uncertainty is mitigated by the leaked rumor, that the IMMO legal model has been approved by one of the auditing companies of the Big Four. 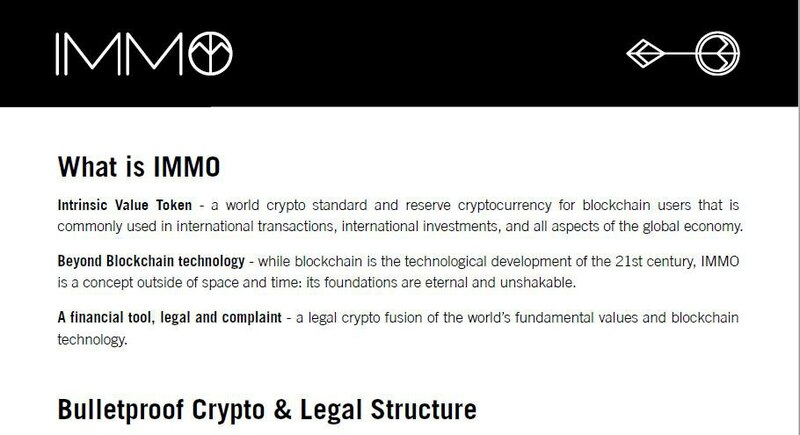 The document states that IMMO FOUNDATION has developed a legal scheme that will allow the project to exist regardless of technology and its features. 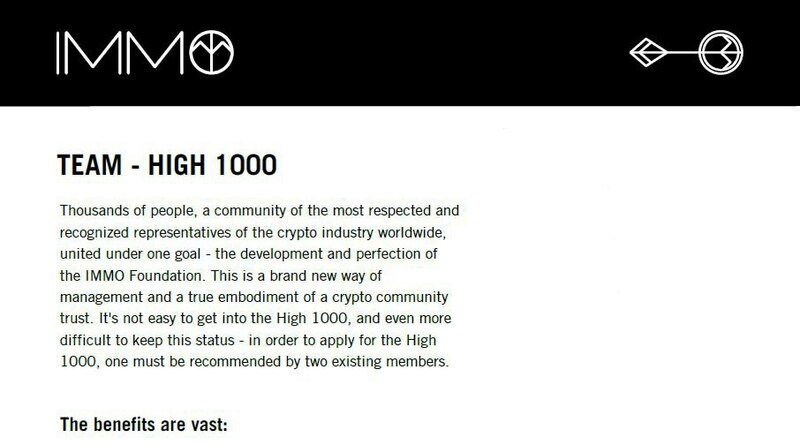 According to the document, the decentralized community High1000 will act as a guarantor of the rights of all tokens as well as the main IMMO’s regulatory body. IMMO High1000 will unite “thousands of people, a community of the most respected and recognized representatives of the crypto industry worldwide.” Each and every High1000 participant will have the right to vote on joint decisions regarding the further development of the project. Additionally, they will be rewarded with all sorts of benefits for their active participation and initiatives. The media found several IMMO.FOUNDATION High 1000 employees on LinkedIn. However, it is unlikely that the mysterious creator of IMMO could be found among those. Various media resources attribute the development of IMMO to the richest bankers’ dynasty, the Rothschilds. However, no information confirming this fact is currently available due to the fact that IMMO does not appear to want to advertise any details of the project. After all, no official statements have been made so far. Because of the continuously growing uncertainty, all kinds of rumors have been spread, the credibility of which is impossible to verify. But one can assume unambiguously that great resources and influence are required for the realization of such a global objective as the formation of a reserve cryptocurrency.